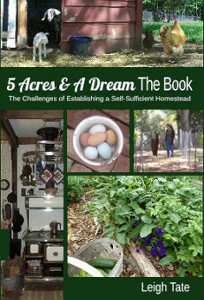 5 Acres & A Dream: Egg! I am proud to announce our first egg! Laid yesterday morning by our lovely, 19 week old Delaware pullet. I know you all are standing by with bated breath, absolutely overcome with curiosity to know where she laid it. In my thoughtfully and carefully constructed 3R nest boxes??? Not exactly. UPDATE: Just before I was about to hit the "publish post" button, Dan brought in her second egg, freshly laid this morning. It looks about the same size, but weighs in at 1.2 oz. Congratulations! There's not much like finding your very first, homestead-laid egg. 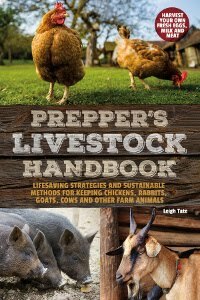 Over the years, we've raised all manner of animules on our homestead, but even though chickens have not been my favorite, they would be the last I'd want to give up because of those incredible, edible EGGS! That's just too cool! I love it!!! Cute eggs. 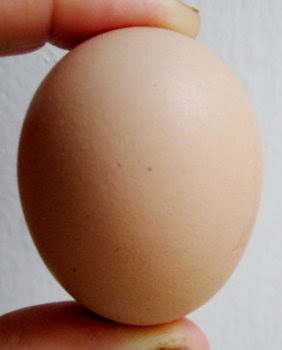 I just bought some pullet eggs at the farmers market! 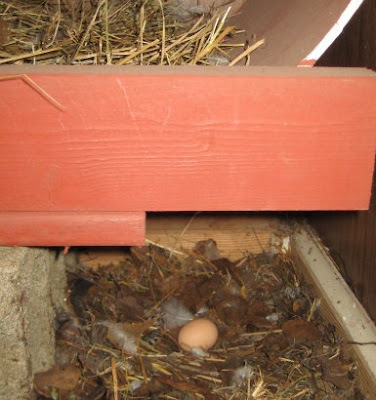 I'm sorry, but I had the thought that they would ALL lay their egs under the boxes and you'll have to crawl under them to get the eggs. Still, I hope it gives some of the other hens the right idea. I assume you had these eggs for breakfast. I remember how exciting our first eggs were, so I know how you must feel! 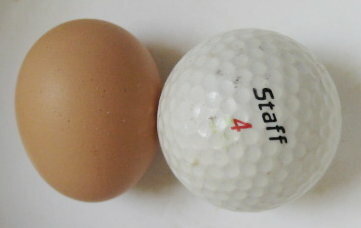 Our hens have really slacked off this year, so now I'm feeling the opposite -- frustrated! So good! What a triumph, for nature, for the hen, for 5 Acres! congrats! that's great news. I do hope that your other chickens get the idea soon. YEAH!!!! It's a very exciting feeling to get your first egg. are they going to end up as the freshest breakfast treats ever? :)) and two from the one girl - you need to give her a good pat! Congrats, Leigh! I knew you'd be getting eggs soon! And soon the other pullets will follow her lead! Whew, our internet has been down due to lightening in the area. I've only had it one day out of five. Theresa, LOL. Not sure what I'd do with a bronzed egg except dust it! Mama Pea, it really was a thrill. I have to admit the chickens are growing on me. I loved the chicks, then wasn't too sure once they started looking like chickens. They really are entertaining though, and now I can't imagine life without them. Sara, I didn't know you could buy pullet eggs. How fun. We've had three now in three days, each one a tenth of an ounce heavier than the previous days. Really cute. Benita, I won't deny that it didn't cross my mind too. Fortunately it isn't much trouble to get them. I'm just wondering what the others will do. Probably follow the leader. We've decided to wait until we have four and then have two each for breakfast. :) One more to go! Michelle, I've been thinking about that for us next year. 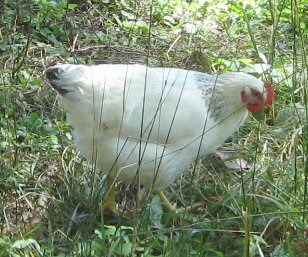 Somehow it would be nice to have a few homestead hatched and raised pullets each year, to keep production up. Whether or not that actually happens remains to be seen! Katrien, it's funny but the hen does feel triumphant. And she lets the world know it! Carrie, that is frustrating. I would be clueless about how to tell the age of a young chicken. Surely someone out in blogland knows! Bettina, we can hardly wait. I'm surprised that we got three eggs in a row. Once we get a 4th, it'll be a special breakfast! Lynn, thanks! I'll be interested in when the others start to lay. Says something about breed characteristics I think. Woo hoo! Congratulations! There's nothing like that first egg. 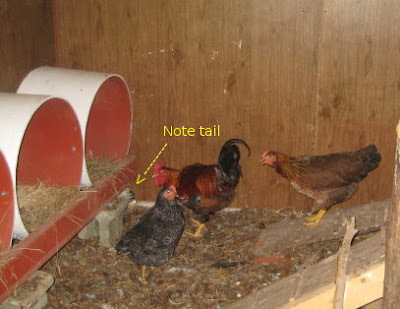 Hens are funny in that they insist on choosing their own place for egg laying. I'm going to guess that she found "her" spot to be a nice, quiet, private corner. Geodyne, I think you're right. The Ameraucanas have started to lay now too, in the same spot!